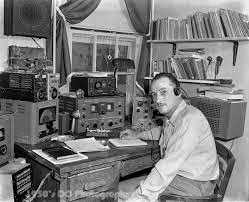 Upstate NY HAM Radio News & Information: Does using your amateur radio in the car qualify as "distracted driving"? 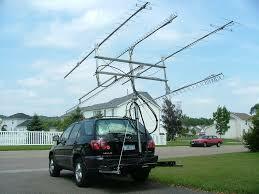 Does using your amateur radio in the car qualify as "distracted driving"? An interesting topic came up on the commute this morning. One of our groups daily Ham radio commuters finishes his QSO with "well I will be taking a standby guys, as I am being pulled over by a NYS Trooper". Then there was silence from our friend for about 10 minutes until he came back with the story. Well, you can almost imagine the story, but he did get a ticket and it brings up a lot of questions. (With that persons permission, we will try to update this article after he goes to court). 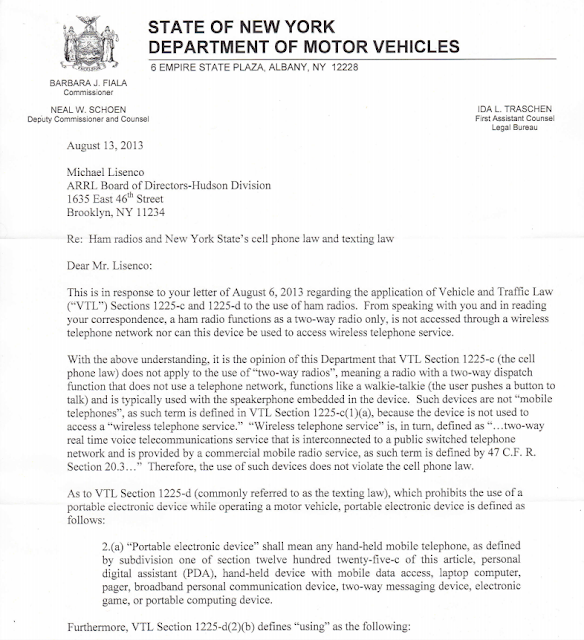 After this incident, another local Ham suggested that we might share some of the legal opinions and references on using our amateur radios in vehicles here in New York State. 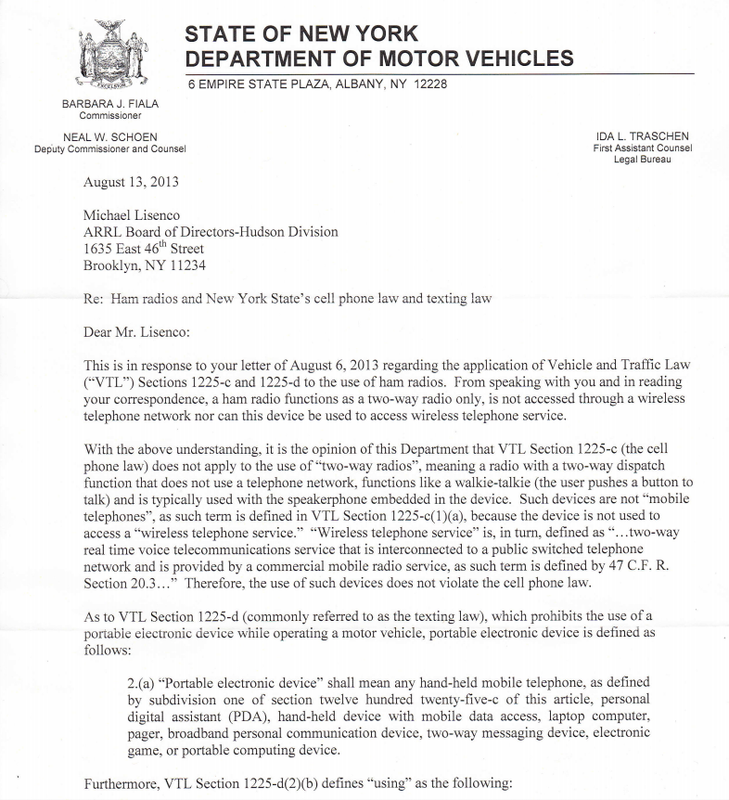 "Given the concern that many hams have regarding the new “Distracted Driving Law” that went into effect in New York this past July, particularly since the law increased the penalty to 5 points on a license, I recently asked the New York State Department of Motor Vehicles Counsel’s office for an explanation of both the cell phone and distracted driving laws and how they apply to hams. The use of two-way radios that are not connected to a public switched telephone service does not violate the “Cell Phone Law.” Therefore, operating a ham radio does not violate the law (Section 1225-c). 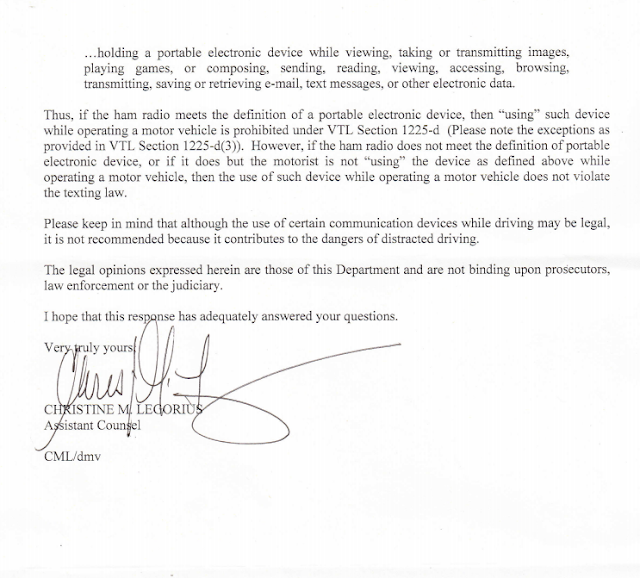 If the equipment in the car is not capable of violating the distracted driving law (including sending text messages, pictures, e-mail, other electronic data, etc. 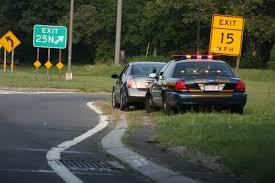 ), then the operator is not in violation of the “Distracted Driving Law” (Section 1225-d). Even if the equipment is capable of violating the law (including sending text messages, pictures, e-mail, other electronic data, etc. ), as long as it’s not used in such a manner the operator of the equipment is not violating the “Distracted Driving Law” (Section 1225-d). In other words, if you are just talking on your radio, you are not in violation of the law. A person, not a police officer or peace officer, acting pursuant to his special duties, who equips a motor vehicle with a radio receiving set capable of receiving signals on the frequencies allocated for police use or knowingly uses a motor vehicle so equipped or who in any way knowingly interferes with the transmission of radio messages by the police without having first secured a permit to do so from the person authorized to issue such a permit by the local governing body or board of the city, town or village in which such person resides, or where such person resides outside of a city, or village in a county having a county police department by the board of supervisors of such county, is guilty of a misdemeanor, punishable by a fine not exceeding one thousand dollars, or imprisonment not exceeding six months, or both. Nothing in this section contained shall be construed to apply to any person who holds a valid amateur radio operator's license issued by the federal communications commission and who operates a duly licensed portable mobile transmitter and in connection therewith a receiver or receiving set on frequencies exclusively allocated by the federal communications commission to duly licensed radio amateurs. In conclusion; it really makes a lot of sense to be informed on these topics in case you are in the position of being stopped while using your amateur radio.